The concept of constructing Smart Buildings didn't just commence today; it has been in existence for a while now. This idea was created as a consequence to conserve energy and build buildings - both commercial and residential – which is energy efficient. This is because energy conservation has become a topic of significant importance to the economy at large. For commercial buildings, the transition to smart buildings is vital to the growth of the organization. It will help the building management save a lot of money because of better efficiency as well as improved overall building operation. Todd Krause, the Chief Commercial Officer of Blue Pillar of Pittsburgh, defines “smart buildings as houses with an elaborate management system that controls the building’s chillers, AV boxes, air handlers among other electrical appliances." 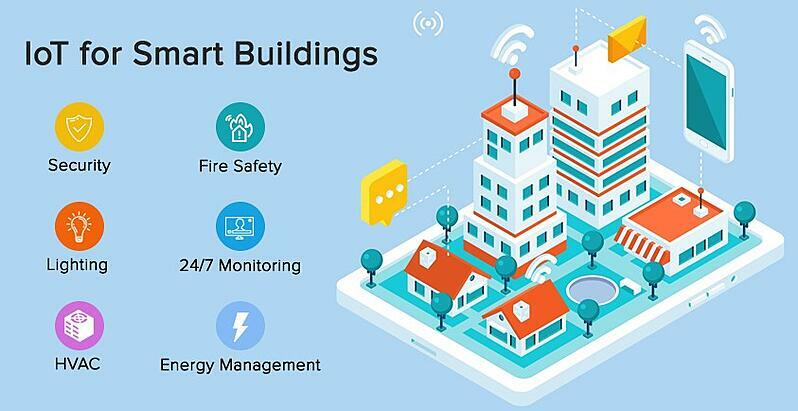 According to Robert Hemmerdinger, business development director with Schneider Electric, all smart buildings, whether big or small, are connected through IoT. Today, these building are more linked with devices than ever. The devices are connected natively to the internet which is way better than having them run through a third party linking a device. The Internet of things (IoT) has created a gateway that would help in managing and controlling elaborate buildings. These gateways are projected to exceed 64 million units in 2021 as per ABI Research. Smart buildings and smart cities are continuously transforming how people carry out their activities on daily basis. Smart cities which are expected to kick off in 2018 will see facilities like street light and parking meters which are connected to commercial buildings, connected to the internet. At present, some cities have started implementing the smart city approach by connecting everything about their community to the internet. 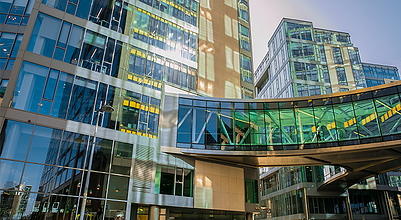 Many tech firms such as Cisco and Philips are already working with government and leaders to develop money-saving technologies for commercial buildings. Smart buildings for commercial purposes will allow owners to monitor and control all that happens in their environment. They also provide comfort, smart security systems, and energy efficient buildings. Also, Smart Building Technology has changed the way building, and facility management is handled at the moment. Presently, a lot of companies are working to establish a network of connected devices that would use various devices to link information and intelligence. Along with conserving energy, smart buildings will help save money. It has been practically proven that in most cases, the ROI can be seen within 12 to 18 months! That is a short span of time to produce very high returns. What are some of the biggest IoT Smart Building trends in 2018? A new trend that is expected in 2018 is the use of predictive maintenance in facility management. Predictive maintenance makes use of IoT sensors and other hardware devices to get a report on the state of a commercial building and all equipment in it. It gives you the exact time when maintenance needs to be performed. All unexpected issues that usually crop up with preventive maintenance can be overcome using predictive maintenance. Also, predictive maintenance makes it difficult for commercial activities to be disrupted because it is performed when necessary to keep the environment running at all time. One major trend to watch for in 2018 is how smart building air quality can have an impact on the productivity of workers. A research conducted by Environmental Health Perspectives shows that workers are 101 percent more efficient in their duty when they work from buildings with good indoor environmental quality than the conventional buildings. 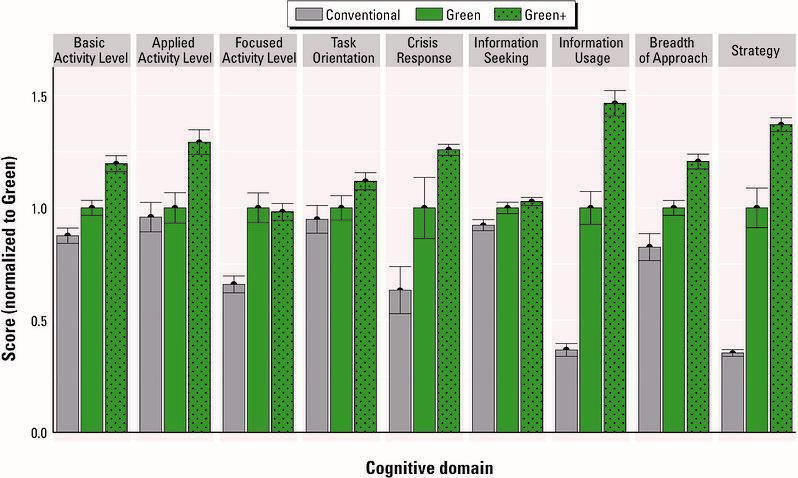 Cognitive Function scores across Green conditions. Source: Environmental Health Perspectives. IoT devices can be used to check and measure the air quality as well as CO2 level in air using various sensors that are interconnected. These devices are connected to all part of the buildings which can help keep the environment and everyone in it healthy and productive. Another new trend to expect in 2018 is the use of applications in smart buildings. For instance, the use of thermal imaging will allow facility managers to check for equipment that are outside of the temperature range. Thus, they can be easily detected and maintenance can be done before the equipment disrupts the system. Another example will be detection of ultra-sonic noises. Electrical transmission lines, which have cracks or holes, produce ultra-sonic sound. This may go unnoticed in usual cases but with IoT technology, you can easily detect the location for maintenance. Another area, which IoT has wholly transformed, is the way commercial facility managers can track information, measure and collect data even in inaccessible areas within commercial buildings. Commercial facility owners can now install sensors in various parts of the building to track all information that they never had access to in the past. IoT allows facility managers to have access to all information using the interconnected systems. IoT offers the ability to collect near real-time data and analyze it with higher spatial resolution. Hence M&V (Measurement and Verification) with IoT data can help in improving energy-conservation Measures (ECM). Another way through which IoT is making a difference in the world of smart building is the speed at which data is reported. IoT devices gives builders insights to react quickly to emerging trends. IoT applications allow facility managers to conduct various experiments to check the result of optimization. It also gives them room to use IoT devices in monitoring buildings systems using one panel. IoT makes it possible for commercial homeowners to have buildings that are energy sufficient. It also influences the design of the buildings and allows them to be eco-friendly and resource efficient. These buildings are made to operate at optimum energy levels. They are also made to detect failure or degradation signs of equipment with effective measurement and verification process as well as tools. These intelligent building management systems can be remotely managed from any part of the world. Moreover, the indoor as well as outdoor environment is sensed at all times to give optimal results for ventilation, lighting, fire and security purposes. IoT allows the use of prefabricated building components in construction of a smart building. This ensures a faster and more cost-effective way than traditional building methods. This building, when used for commercial purposes could lead to less construction waste. Although, using prefab homes for commercial purposes can be complicated, IoT has brought forward various ways through which this can be addressed. IoT has made it possible to replace outdated heavy construction equipment with sensors that can be controlled using indicators like vibrations and temperature fluctuations. Thus, saving a lot of energy, money reduces the maintenance cost, as there are no rotating parts. The most important impact that IoT has on buildings is energy efficiency. The use of networked sensors help in providing information that would help managers to control their assets better and also reduce harmful waste in the environment. There are multiple examples of using IoT for energy efficiency. IoT also helps in better asset optimization. It enables facility managers to use technology solutions, improving uptime of building equipment and avoidance of loss of product. IoT helps in managing large data of all the assets along the value chain. It keeps track of the maintenance of the assets and equipment. It helps with schedule maintenance work orders and makes automated recommendations for equipment replacement. The IoT trend in maintaining commercial buildings and IoT Smart Buildings is on the rise and we would see that increasing in 2018. The first step to implement an IoT solution is understanding what some of these trends are and how it can be implemented in your facility. With these important trends, building and facility managers can finally have a summary of what can offer potential value to meet their performance objectives for 2018.